The Waterside Hotel is the venue choice for couples getting married in Ayrshire and in recent days was named Best Wedding Hotel in the West of Scotland at the Prestige Hotel Awards. A glittering awards ceremony took place at the Glasgow Marriott Hotel where The Waterside was shortlisted alongside quality venues across the country. When the announcement came it was The Waterside that came out on top when named Best Wedding Hotel in the West of Scotland. 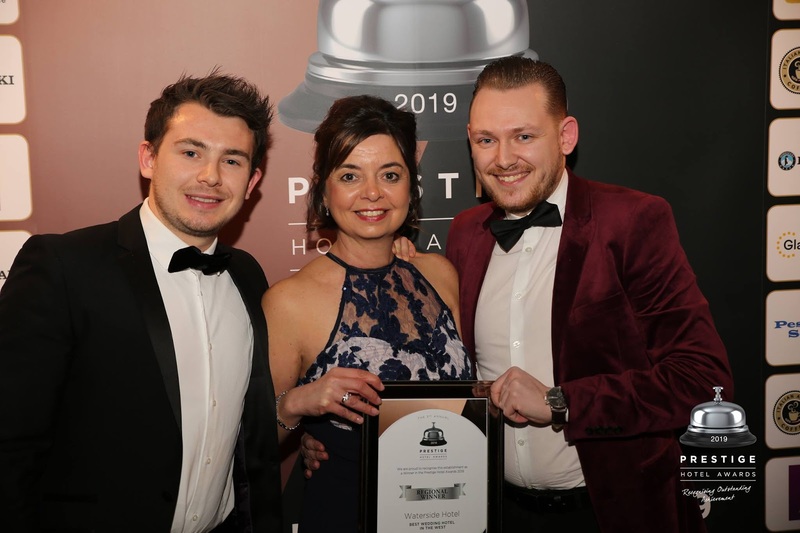 “We are absolutely thrilled to have won this award,” said Janette Mitchell, Sales & Revenue manager for the SimpsInns Group who own and operate The Waterside and another popular wedding venue in Ayrshire, The Gailes Hotel. “Ever since The Waterside opened as a hotel and wedding venue in 2015, couples who get married with us have been simply blown away by the venue. “Wedding parties and their guests love the place with so many stylish features such as the private gardens and boardwalk that leads onto the beach with panoramic views at every turn. The Waterside really has become one of Ayrshire’s standout wedding venues. The family owned hotel boasts a full range of luxury bedrooms and suites plus the magical Spa Suite for wedding couples. The Spa Suite with private balcony and views to Arran is the perfect complement for every wedding day. The Kyle Suite and Ailsa Lounge is designed so that it can host the most intimate of weddings and ceremonies to large celebrations for up to 250 guests. Floor to ceiling folding glass doors that open out to the covered decking area and into the gardens, ensures guests have the best of views from every vantage point. For those all-important photographs, the inlet beach with Arran in view serves as the perfect backdrop to capture those memories to last a lifetime. “Every wedding is special to us at The Waterside,” explains Ryan Porter, Operations Manager at The Waterside. “We do whatever it takes to ensure all our couples have the day of their dreams. Winning this wonderful award is recognition of the team’s hard work and all the effort they put in for every wedding. SimpsInns is a family owned hospitality business based in Ayrshire with luxury leisure hotels, restaurants, bars, golf, leisure and spa.